Seattle is quickly becoming one of the nation's most bicycle friendly cities. Many Seattleites take pride in the fact they commute to and from work on their bicycles to be more eco-friendly or simply for the exercise. As summer approaches, it is important that those who do choose to bike to work choose their routes wisely. Within the last couple of weeks, we have already seen a rise in bike v. car accidents. This recent spike has illustrated a clear need to point out some biking safety tips as well as areas to avoid if you are or are planning on bike more as the weather continues to improve. Many bikers are already very adamant about making sure they are wearing their helmets when they hit the road or trail, but many are not. Riding a bike without a helmet is not against the law in Washington, but it is required in both King and Pierce county as well as a handful of other cities around the State. Around the nation, one of the most common bicycle/car accident locations is at intersections where cars driving out after a stop sign simply do not see the cyclist. That includes when a motorist is turning left and the cyclist goes straight and once again the motorist simply does not see the cyclists. These honest mistakes can lead to very serious injuries or even death for cyclists so the best thing to do to avoid these injuries is to exercise extreme caution while at intersections. Bikers who choose to ride against the flow of traffic are on average 3.6 times the risk of those traveling with traffic, and as high as 6.6 times for those 17 and under. The reason for this difference is easily explained. Because motorists normally scan for traffic trav­eling in the lawful direction, wrong-way traffic is easily overlooked. To be safe, ride with the flow of traffic. The Ballard Bridge: the bridge itself is very narrow for cars, bikers who choose to ride with traffic are asking for trouble. If you do need to ride across the bridge, be sure to ride on the sidewalk portion located on each side of the bridge. Nickerson St: Like the Ballard Bridge, Nickerson Street is very narrow. In addition most of the traffic on Nickerson street travels well in excess of the speed limit, making it harder to avoid cyclists on the side of the road. Westlake Ave: With the Street car tracks on the street, it is easy for a cyclist's tire to get stuck in one of the tracks and fall. In addition, Westlake has a high amount of traffic throughout the day. Traveling down Dexter Ave is a much safer option. 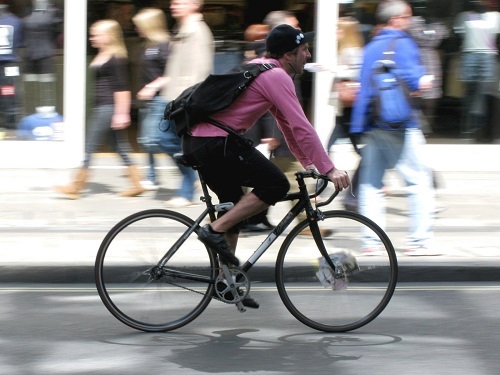 There are many more areas that would be good to avoid, but if you can specifically avoid these three areas in the Seattle while on a bike, we at Davis Law Group are quite certain that you will be much better off.